Apple owners looking for an easy to use desktop and mobile Apple Watch charger may be interested in a new Kickstarter campaign for the Pawatch charger created by Pawa8. 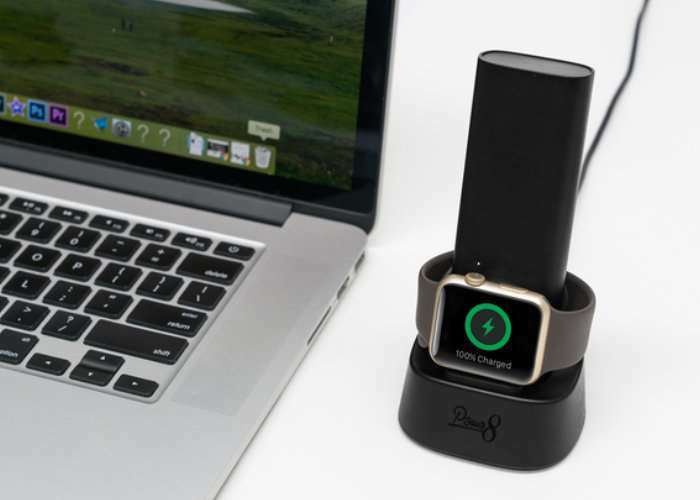 The unique Apple charger includes both a pocket -sized battery pack which is capable of charging your phone and Apple Watch as well as a desktop charger which allows you to conveniently charge your Apple Watch when at your desk. Watch the demonstration video below to learn more about the unique design which provides the best of both charging devices which you would normally need to purchase separately. We present to you the PaWatch, an ULTIMATE Charging Solution For Apple Watch, fulfill every need of yours whether you are at home, in the office, or on-the-go. As an Apple Watch user, there are too many portable powerbanks on the market, did you ever feel hard to choose or even differentiate between them? I always looking for the PERFECT one for myself, those normal powerbanks disregard the needs of us, not only charging up my phone, but also the Apple Watch. I am a typical business man, busy for work and traveling around, Apple Watch is my constant companion, keeping me on time, on my schedule, it became a part of my life. But everyday I have to bring along at least TWO charging cord, powerbank, seems a little bit too much, I cannot afford any of my iPhone, Apple Watch or Macbook went out of battery, that can cause huge problem. I have been looking for a way to solve the problem – messy charging cord and bulky powerbank, I need something simpler, but better. Visit Kickstarter for full details and all available pledges which start from $59 with shipping expected to take place next month during November 2017.